My family has continues to sample some of the other items my local rancher has for sale, and we have loved everything. Bacon, breakfast sausage, lamb – all have been delicious. 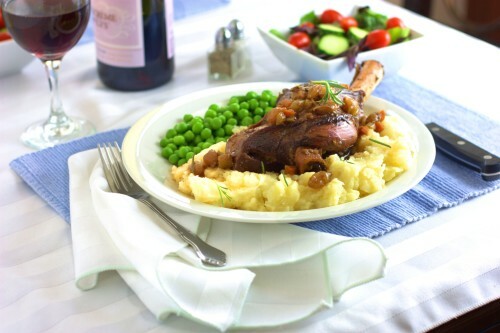 This week I decided to try the lamb legs and create a recipe that rivals the dish I like so much at one of the local restaurants. 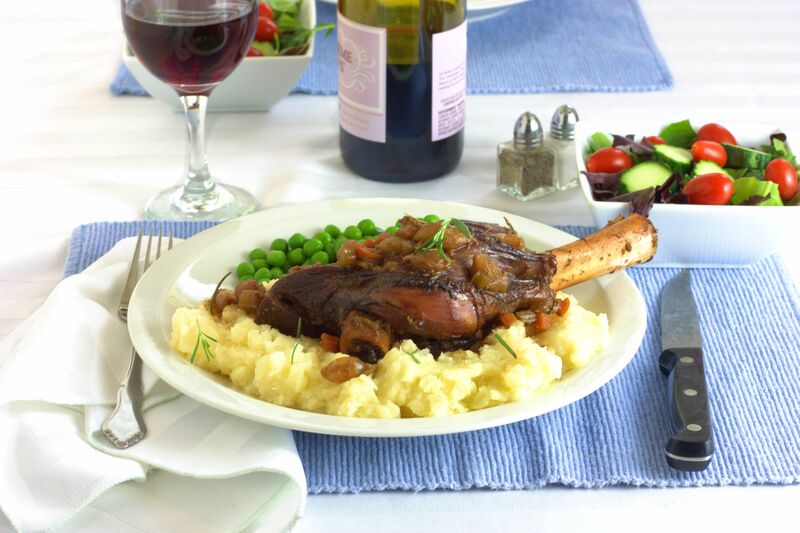 For some reason I was daunted by the long cooking time required to make decadent, fall-off-the-bone lamb shanks. And then it hit me – isn’t that what a slow cooker is for?? Silly me. Sure enough, my crockpot produced the succulent lamb legs I was hoping for, and the upfront prep was minimal. 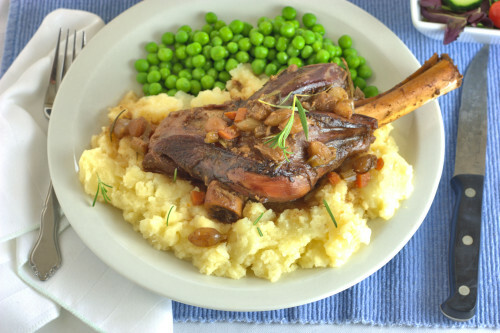 I served the lamb shanks over horseradish mashed potatoes (made with some of the Saucy Mama creamy horseradish sauce) for a restaurant quality dinner. 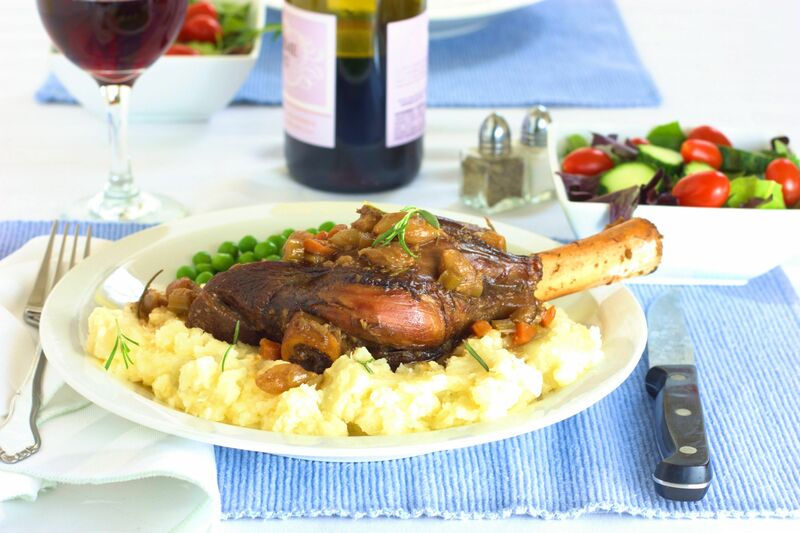 It looks like I have to find a new favorite entrée then next time I visit that local restaurant, since I can now easily make the lamb shank myself! In a small bowl, combine 1 cup of the beef stock, Dijon mustard, salt, and pepper. Over medium-high heat, brown the lamb legs on all sides and then lay the shanks in a 5-6 quart crockpot insert so they fit, then scatter the pearl onions over the lamb shanks. Add the garlic, celery and carrots to the pan used to brown the lamb and cook until fragrant, about 1 minute. Deglaze the pan with the beef stock and add to the small bowl with 1 cup of the wine and rosemary. Pour the liquid over the lamb legs. Cover and cook on HIGH for 6 hours. Halfway through the cooking, add the remaining stock and wine to maintain the braising liquid. Use a slotted spoon to transfer the shanks to a serving platter. Serve with mashed potatoes, and the remaining juice in the crockpot as gravy. This entry was posted in Entree and tagged garlic, lamb. Hi, a bit confused with the Liquid explanation. How much beef stock mix is left if deglazed pan with it? Didn’t say to pour half… I will add it all and keep broth and wine avail if needed? Hi, Keri! I can see how that would be confusing. 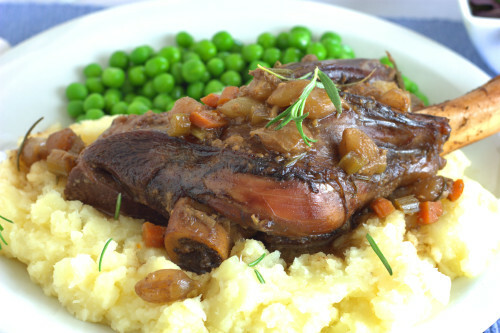 Initially the liquid added to the slow cooker is 1 cup of beef stock (the cup added to the small bowl is used for deglazing) and 1 cup of wine, with 1/2 cup of each reserved for halfway through cooking. Like you suggested, keeping additional broth and wine handy is a good idea, since slow cookers can vary. If the liquid in the cooker gets too low (and you have exhausted my recommended stock and wine), I would add more of both stock and wine (1/2 cup of each). Let me know if you did need more liquids (and your slow cooker model and size). Thanks!